Combination planting—where certain crops are planted together to stave off pests or enhance taste—is as old as farming itself. But up until recently, it’s been difficult to be precise about where and how different crops can benefit from each other. Benedikt Groß, a UK-based interaction designer, is using algorithmic processing to improve on a practice that's thousands of years old. Groß’s idea actually stems from a fairly recent development in European farming culture: Biogas production. Across the EU, government subsidies for farmers who farm biogas crops are inspiring what Der Spiegel recently called “a modern day land grab.” Across the continent, farmers are buying up new land to plant corn and other biogas crops. But just like every other crop, these plants are still subject to age-old problems, like vermin—which generally means farmers have to use pesticides. That’s where Groß comes in. His idea is to use the thousand-year-old concept of combination planting to reduce the need for chemicals. Combination planting is old, but the way Groß applies it is new. Using an algorithm written in the visual scription program Processing, he’s developed a way to generate complex planting maps that play to the unique complexities of each plot of land (the crops are planted using a GPS system, which is actually a fairly common approach among modern farmers). Does this mean parametric design is poised to transform farming? Not quite. 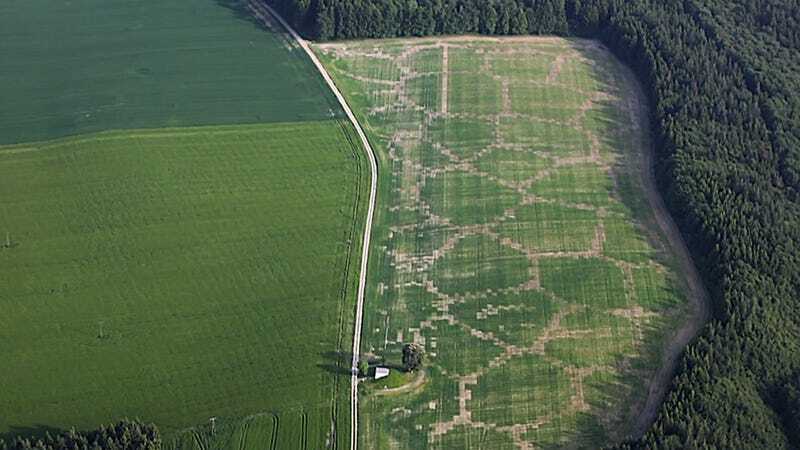 After all, it’s hard to say whether the money saved in pesticides is more than the cost of mapping and precision planting. Groß explains on his website that the point of his testbed was simply to illustrate how digital fabrication could eventually aid farmers. Avena+ Test Bed — Agricultural Printing and Altered Landscapes from Benedikt Groß on Vimeo.